· Interchangeable temple arms and strap system for intense activities. · Removable padded insert for extra protection against the elements. · Lightweight and durable frames with a unique wraparound style for enhanced peripheral vision. · Polarized lenses with 8K optical technology. So when do I wear my Australia1 sunglasses? · Polarized lenses that are so clear and colors are so vivid. · My USA1 sunglasses are white and my Bermuda1 sunglasses are tortoise so I was excited to receive my Australia1 sunglasses in matte black with polarized grey lenses! YEAH! Black sunglasses are definitely more my style. Black not your thing? They also make the Australia1 in matte tortoise and matte white/black with both grey and brown lense options. · They sit comfortably on my nose and I like that there is no adjustable nosepiece like the USA1. I haven’t had any trouble with bouncing or sliding around while outside running around in them. · It’s super easy to remove the temple arms and add the accessories. · All XX2i sunglasses come in a hard, protective case. They also come with a soft case that doubles as a cleaning cloth. 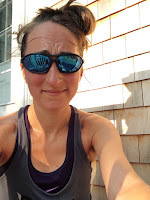 · On numerous hot and humid runs, the lenses have fogged up. The Australia1 does not have a “venting system” like the USA1. · I personally have no need for the straps and extra padding. I’m sure they would be great if I was out on a mountain bike or participated in any extreme sports! · The frames don’t seem as sturdy as the USA1 which I think could be because you can take off the temple arms - BUT XX2i has a lifetime frame and lense warranty if anything happens to them! Check out the XX2i website. They offer lots of frame colors and options for lenses. Worried that they won’t fit you? XX2i gives you 265 days to return their product. Join us on Twitter for the XX2i sponsored #BibChat on August 16th at 9pm EST! And don’t forget to use code XX2iRocks for 50% off your order!